BISD Adult Continuing Education strives to assist adults with completing their High School Equivalency (GED, HiSET) examinations, learn English, and receive training/certification for employment. All services are free to Cameron County residents. Please call us for more information. Congratulations to Cristina Gonzalez for becoming a Microsoft Office Specialist in Word! Cristina also obtained her GED in our program 😉 ACE continues to provide FREE training for high In-demand jobs, such as General Office for our students. This year ACE has started an Introduction to Computer Systems Academy and a Microsoft Office Computer Academy. Call to learn about our award winning program 956-548-8175. Congratulations Joseph Jovanni Moran on passing your Official GED examination! 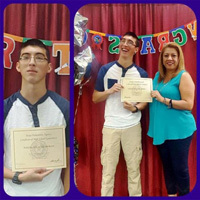 Joseph is a student in Ms. Gonzalez's High School Equivalency class at ITEC 🙂 Call to learn more about our award winning program at 956-548-8175. 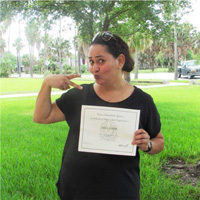 Congratulations Asma Nadir on passing your Official GED examination! Asma is a student in Ms. Esparza's High School Equivalency class and Microsoft Office Specialist class at ACE. Asma plans to pursue a career in nursing 🙂 Call to learn more about our award winning program at 956-548-8175. If you're ready for change, complete our enrollment form and then contact us to schedule a visit. Hurry, classes are forming now! Please contact us with any questions about the enrollment process at (956) 548-8175 or Click Here to submit your information. An A.C.E. enrollment specialist will contact you shortly.